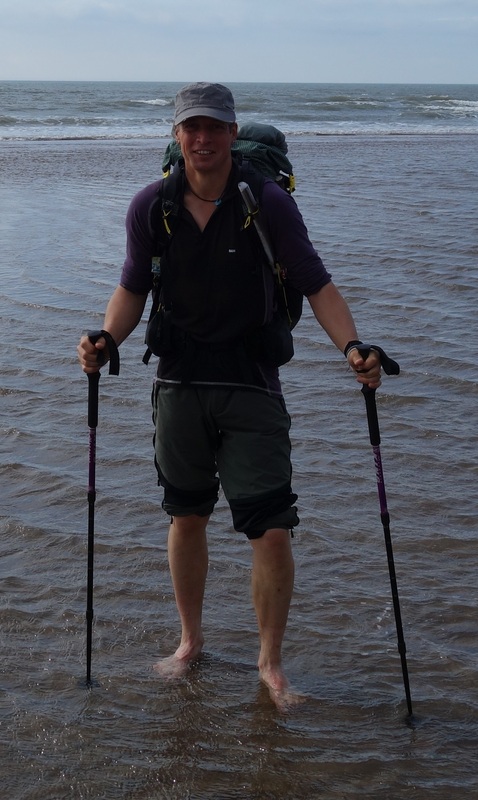 I’ve been back home now for a week since completing the TGO, a week which has seen me clear the house completely of every last scrap of food in an effort to fend of what can only be described as an unnaturally large appetite. I’ve been shovelling calories down my throat faster than Sainsbury’s can home deliver it. All sorts of junk has been devoured and yet here’s the curious thing; I didn’t lose an ounce on the walk and I never felt hungry! So why the sudden hunger now? A strange thing seems to happen on long backpacking trips…after several days, once my mind starts to switch off from the normal irritations and pains of life, my body starts to follow suit. Peperami and Primula on oat cakes start to taste like three star Michelin food. Five day old unwashed armpits start to smell, well, quite acceptable. Sitting under a tarp in the cold and rain starts to feel luxuriously comfortable compared to being the other side of that thin sheet of silnylon. Who needs a living room, a blazing fireplace and a roast dinner when you can be as toasty, dry and well feasted as this? After 8 days without a bath, I decided to sit down-wind so nobody would notice. Such feelings are unfortunately short lived, and your body just seems to know when it’s safe to drop the big charade and fall apart. 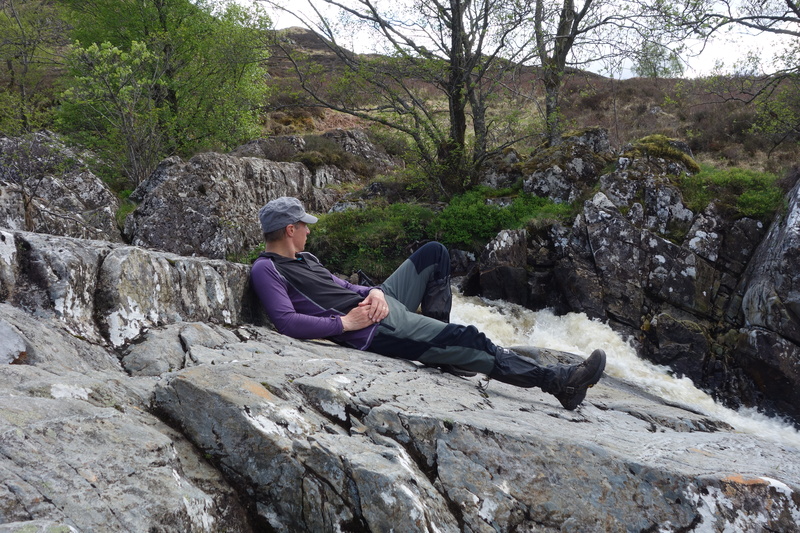 No sooner have you reached the end of your walk than it’s cue aches, pains, hunger, and that bloody heavy rucksack that’s suddenly appeared on your back. I witnessed this phenomena in full swing at St Cyrus as Challengers skipped full of the joys of spring down to the beach, only to reappear minutes later limping to the bus stop like Quasimodo. And so as this week has passed I’ve been forced to face up to a few things on this year’s TGO which in the cold light of a normal day I would not naturally do, and some of which bring shame to my good name. Indeed the painful realisation of some of my behaviour has forced me to enter a period of rehab. Of course the signs were all there in Braemer, where I sank to a new personal low in alcohol consumption. Having already polished off a half bottle of Bunnahabhain 12 year old Islay Single Malt in the first few days of the trek, I was desperate for more. Not that I was alone in this predicament as I’d happened on another Fellbound challenger (who shall remain nameless) who didn’t even appear to care whether he got hold of a decent malt or a counterfeit blend. He just craved whisky. So I can only apologise to the residents of Braemar who had the miss pleasure of witnessing what can only be described as two unwashed and weary vagabonds, standing on the pavement outside the off license drinking cheap whisky from the bottle……..at breakfast time. In fact we were so desperate to empty the entire contents of a bottle that some was spilt on the pavement. To round off this sorry episode, my compatriot then re-entered the off license with the empty bottle, presumably to ask if there was a refund, only to have the shop owner exclaim ‘There’s a drop left in that bottle!’ and promptly removed the cap and swigged it himself ! In my defence I should state that as a TGO virgin lacking the willpower of a seasoned veteran, I’m open to being led astray. The first challenger I met on the train travelling up to my start at Strathcarron was a certain Mr Pidgeon, who introduced himself by way of an Iron Brew bottle of whisky, and proceeded to show me how to use my waterproof phone case as a pee bottle. I’d decided to start my first TGOC from Strathcarron for a simple reason; you can head straight out into the wilds from there with no messing about. So it came as a bit of a shock at breakfast on the first day (with a thick head) to find that the tide had gone out and the start had moved a mile down the road in the wrong direction, the direction I wasn’t heading. After prolonged discussion over breakfast residents of the Strathcarron Hotel split into two distinct factions. Those with the conviction that a purists start had to involve getting your feet in the briny stuff first, and those who responded ‘b****r that’. Leaving packing until later, myself and two other lone purists set off down the road to find evidence of seaweed, and ensure that our trek wouldn’t result in sleepless nights. So you can imagine how mortified I now feel after walking 230 miles across Scotland only to be quizzed at St Cyrus ‘You did carry your rucksack down to the shore with you at the start didn’t you?’. It rather begs the question, what is a purists TGO crossing ? What does ‘unsupported’ mean in pure terms? Does this exclude the use of B&B’s for example, or is this simply referring to the banned use of a jockstrap on the TGO? Would an unsupported crossing exclude the use of resupply shops or the wearing of man-made fibres? Should a purist walk coast to coast naked as the day you were born, only eating what you can forage along the way? B****r that, pass me the Fuizion Foods Coq au vin will you. Having realised this week that I now need to seek help for a hard liquor problem I didn’t know I had, and seek redemption for an impure start, it came as bittersweet that some of the rehab clinics are offering a ‘buy two, get one free’ offer. So I asked whether I could throw a fledgling addiction to the TGO into the mix. The response was not positive. It appears that there is no known cure for this and that society simply has to accept such unfortunates as myself. Indeed Scotland appears to be some sort of equivalent to the legalised cannabis cafes in Amsterdam, a place where backpacking addicts can wander freely and enjoy their guilty pleasure without fear of rebuke. As you can probably tell from all of the above drivel, I’m not attempting to write a day by day account of my crossing as it was all a bit of a technicolor blur. So I’ll be following this with a few posts about the whole experience in general and weave photos into those. It’s all part of my therapy you know. What a grand way to cross. In a blur just so that you can make an excuse not to blog about the detail. Shame! Mind you I did bump into you a few times and quite understand. By the way there is no “e” in Whisky. Great to meet you John. Have no fear Alan, detail to follow. Just needed to make a start before my memory fades. p.s. Spelling was never my strong point. No ‘e’ in whiskey? Depends which side of the Irish Sea you live on, Alan. Note to self. Reset spellchecker from Irish. This is far and away one of the best Challenge write ups I have seen. Great stuff! I do think you ought to get a grip, though, of your alcohol problem. Drinking whisky in the streets of Braemar in the morning is just not on. Thankfully I have not had the urge to repeat the episode David. Living as I do in ‘Happy Valley’ where apparently murder and abduction is common place, nobody is likely to be a good samaritan to an unfortunate drunk. And I am not sure I dare report on the amount of whisky & sloe gin consumed. But not in the same ball park as that Mr Pidgeon. Glad you had a good 1st TGOC. I had a ball Andrew, extremes from swearing at bogs that I fell into on the west, to laughing till it hurt in the company of others in the east. It went so fast though…no idea where the two weeks went. 🙂 it is difficult to adjust to “normal” life again. The planning for next year starts now. I wonder how many do carry their rucksacks to dip their toes at the start. I know what you mean Robin. My metabolism seems to be able to turn a fried breakfast into lucozade at the moment. And I just keep looking at maps and planning the next trip. Hopefully cram a few weekends in over the summer and then another longer trip in the autumn. When I get home I nearly always have a hankering for fresh fruit, even though it’s not my favourite food. So it’s straight down the shops to buy a load! 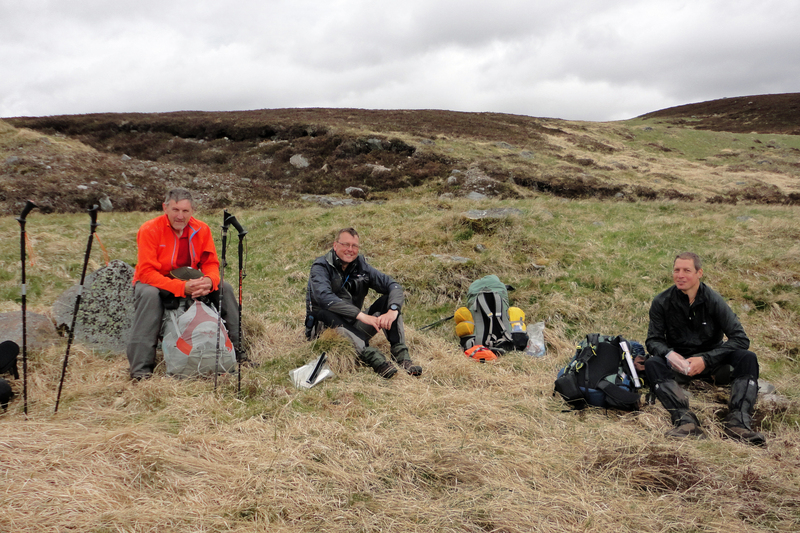 As for ‘eight days without a bath’ – that is one of the downsides of hiking. I always take public transport when hiking as I don’t like the idea of driving after a big walk. On the train, I’m very aware that I smell a bit and always try to stay as far away from people as possible! Probably the thing I miss most backpacking, fresh fruit. I’m almost a fruitarian. As for the stench, I walked the 100 mile Isle of Man Coastal walk last year in a pair of Teva sandals. Really liberating for my feet, but my wife almost liberated me from the car when she picked me up at the end. Funny how you don’t notice the pong until you’re in a confined space. I’d be happy if they cleared the place of blends entirely. I can’t even remember the name of the obscure painstripper that David was tempted to purchase, I wouldn’t have poured it over haggis, never mind my taste buds. Mellow is the man who knows what he’s been missing. Many many men can’t see the open road.